I'm really hoping the title explains it all, but if you need more explanation, then here it is. 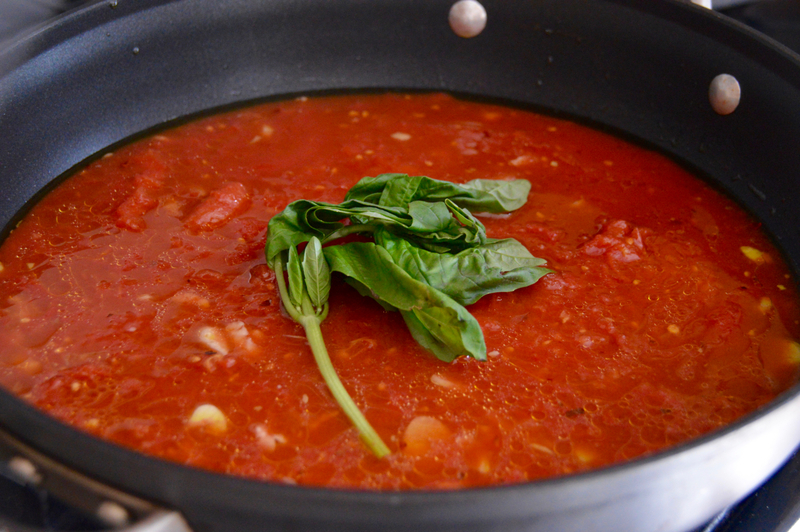 Marinara sauce that tastes authentic, light, flavorful, and using just 5 ingredients. If there's one recipe everyone should know by the time they're 30, it's how to make your own sauce. Store bought jars of sauce are full of sugar, and the ones that aren't are super expensive. Of course it's good to always have a jar on hand for when time gets tight, but once you learn how to make this easy marinara, you may never buy store bought jarred sauce again. Marinara sauce is great stored in the freezer too, so you can always make big batches to freeze for later meals. It is also important to note that you should be using a heavy-bottomed ceramic or non-stick pot, but not a metal pot. Metal will offset the flavors of the tomatoes, leaving you with a different tasting sauce. I use seven or eight cloves of garlic, mainly because I love it, but also because it gives the sauce so much flavor. I also take half of a yellow onion for every 4 cans of sauce and dice it up as finely as possible. The onions, when simmered in the butter and oil, give the sauce a little bit of sweetness. Using a really high quality olive oil, coat the entire pan with the oil, enough to make a thin layer across the bottom of the pan, and warm it over medium-high heat along with 2 tablespoons of unsalted butter. Once the butter melts, then add your garlic, onion and a pinch of salt. Once the onions and garlic have softened and become translucent, it's time to add the tomato paste. Stir the tomato paste to combine with the onion and garlic, then carefully pour in the crushed tomatoes, salt and sliced fresh basil. Let everything simmer together over very low heat for at least 30 minutes to an hour. Taste test for salt, which you will probably need more of, and then serve! This is also great to freeze in smaller containers for meals later on, and like any sauce, stew or soup, this sauce will always taste even better the next day, once the flavors have really melted together. Heat a heavy bottomed, ceramic pot with the oil and butter over medium-high. Once the butter melts, add the garlic, onion and a pinch of salt. After the onions have softened and become translucent, stir in the tomato paste. Carefully pour in the tomatoes, about 1 teaspoon of salt, the red pepper flakes if you're using them and the basil into the pot, stir, and turn the heat down to low to let everything simmer together for at least 30 minutes - 1 hour. Serve immediately, store in the fridge up to 3 days or freeze for later use.